Credits: Three-piece bridal set by Lela Rose, photo by Cleo Sullivan for BRIDES Magazine, glitter ball ornaments, peacock feathers by Katelyn James. Glass peacock vase from Fringe Studio, vintage peacock rsvp from 'i do' it yourself. Peacock cake via Brides. 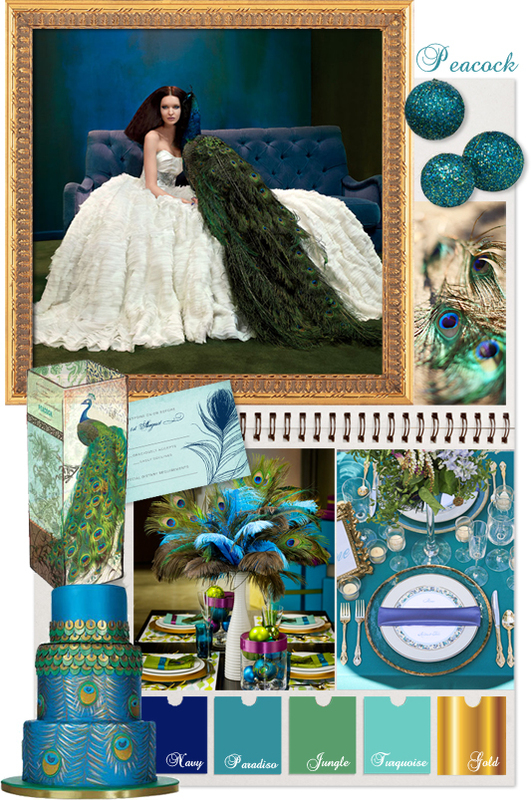 Peacock inspired party setting via Hostess with the Mostess. Turquoise place setting via The Wedding Chicks. Beautiful colours ... but I hope you will also include my favourite the WHITE peacock.